by a very pleasing 22-7 win at home to Worksop College. The next two games turned out to be entirely different propositions. The trip to Durham School was always going to be a challenge and a 50-12 score-line does reflect the difference between the two sides. shown throughout the game by all the players, led by inspirational captain, Henry Marsden. 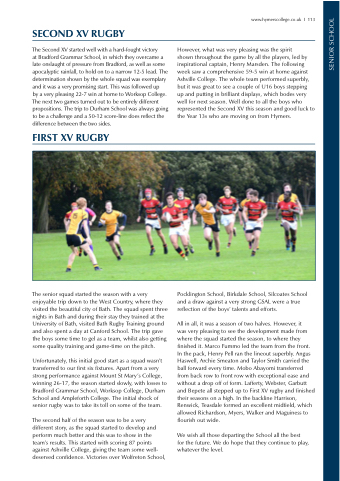 The following week saw a comprehensive 59-5 win at home against Ashville College. The whole team performed superbly, but it was great to see a couple of U16 boys stepping up and putting in brilliant displays, which bodes very well for next season. Well done to all the boys who represented the Second XV this season and good luck to the Year 13s who are moving on from Hymers. The senior squad started the season with a very enjoyable trip down to the West Country, where they visited the beautiful city of Bath. The squad spent three nights in Bath and during their stay they trained at the University of Bath, visited Bath Rugby Training ground and also spent a day at Canford School. The trip gave the boys some time to gel as a team, whilst also getting some quality training and game-time on the pitch. Unfortunately, this initial good start as a squad wasn’t transferred to our first six fixtures. Apart from a very strong performance against Mount St Mary’s College, winning 26-17, the season started slowly, with losses to Bradford Grammar School, Worksop College, Durham School and Ampleforth College. The initial shock of senior rugby was to take its toll on some of the team. Pocklington School, Birkdale School, Silcoates School and a draw against a very strong GSAL were a true reflection of the boys’ talents and efforts. was very pleasing to see the development made from where the squad started the season, to where they finished it. Marco Fummo led the team from the front. In the pack, Henry Pell ran the lineout superbly. Angus Haswell, Archie Smeaton and Taylor Smith carried the ball forward every time. Mobo Abayomi transferred from back row to front row with exceptional ease and without a drop off of form. Lafferty, Webster, Garbutt and Bepete all stepped up to First XV rugby and finished their seasons on a high. In the backline Harrison, Renwick, Teasdale formed an excellent midfield, which allowed Richardson, Myers, Walker and Maguiness to flourish out wide. for the future. We do hope that they continue to play, whatever the level.